1 What is Trade Assurance? 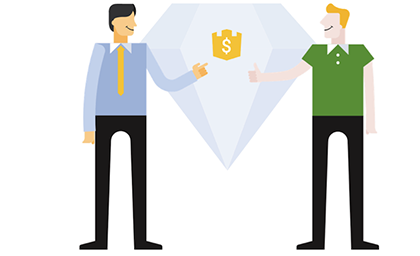 Trade Assurance is a free service offered by Alibaba.com that's designed to help create trust between buyers and suppliers. Trade Assurance covers you in the event of shipping or quality-related disputes. 2 How to use Trade Assurance? a. Start an order online with a Trade Assurance supplier. You can place an order online or ask your supplier to draft an order for you. For your convenience, uploading a PI is recommended. b. Make a payment to the bank account designated by Alibaba.com. You can pay online directly on our platform via Credit Card and e-Checking.Or you can pay via Telegraphic Transfer (T/T), and the beneficiary account information can be found on the order details page. If you are Brazil buyer, you can use Boleto to pay. Pay Later only available for some USA buyers. b. Click "Contact Supplier | Chat Now" to make an inquiry. a. Place a Trade Assurance order just like any other order, just make sure the supplier has the Trade Assurance icon. After negotiation, ask your supplier to draft an order for you. The supplier can place an order online or upload a PI. b. You can click "Start Order" on the product details page, or the supplier's minisite and complete the required fields yourself. Or you can go to "Message Center" to start an order. Product Inspection Service: For better product quality control before shipment, we recommend asking your supplier to include a third-party inspection service in your Trade Assurance order. After checking that your order is correct, send your initial payment. 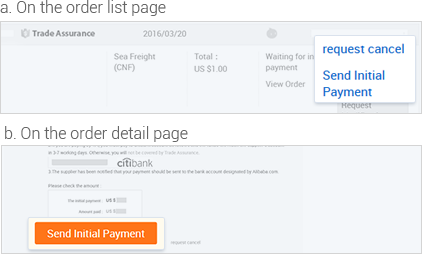 You can sign into "My Alibaba" to find the order you want to make a payment for. e-Checking is only available to buyers with checking accounts from any bank in the United States and Europe. Competitive rates. Favorable terms. No order transaction fees. Flexible access. Use funds right away and as often as you need. Straightforward payments. Pay simple monthly fees with no prepayment penalty. Why does my payment status still say "pending payment"? >e-Checking: After paying by e-Checking, the order status will state "payment processing". This is because it takes 4-5 working days to reach the suppliers account. The order status will then change to "waiting for supplier's shipment". >Credit Card: After paying by credit card, the payment status will be updated in the system within 30 minutes. Thank you for your patience and understanding. >Telegraphic Transfer (T/T): After paying by telegraphic transfer and your payment has been received, the status will change to "waiting for supplier to ship order". 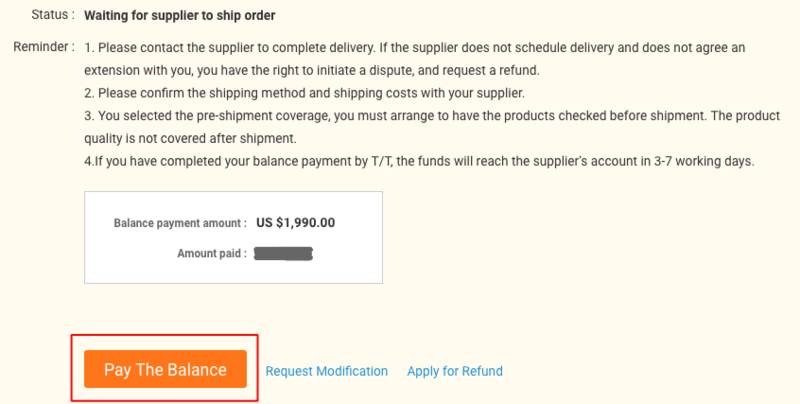 If the supplier has received your payment but the status still shows "waiting for payment", please click here to contact Alibaba.com's customer service team. Please check your shipment in "Delivery Details" or contact your supplier. Once you have made the initial payment, you can negotiate with the supplier to pay the balance before or after your order has been delivered. Go to the "Order Details" page and click "Pay the Balance". Choose to complete the balance payment with e-Checking, Credit Card, Wire Transfer (T/T), Pay Later, or Boleto. When the order has been shipped and your balance payment has arrived at your supplier's account, your order status will change to "Waiting for Delivery Confirmation". You can then click "Confirm" on the order details page to confirm receipt of your shipment. When you have confirmed receipt, the order will be complete. You may then leave feedback about the supplier to share your overall experience with other buyers. Trade Assurance covers you in the event of shipping or quality-related disputes. Credit Card: receive the refund within 10 working days. 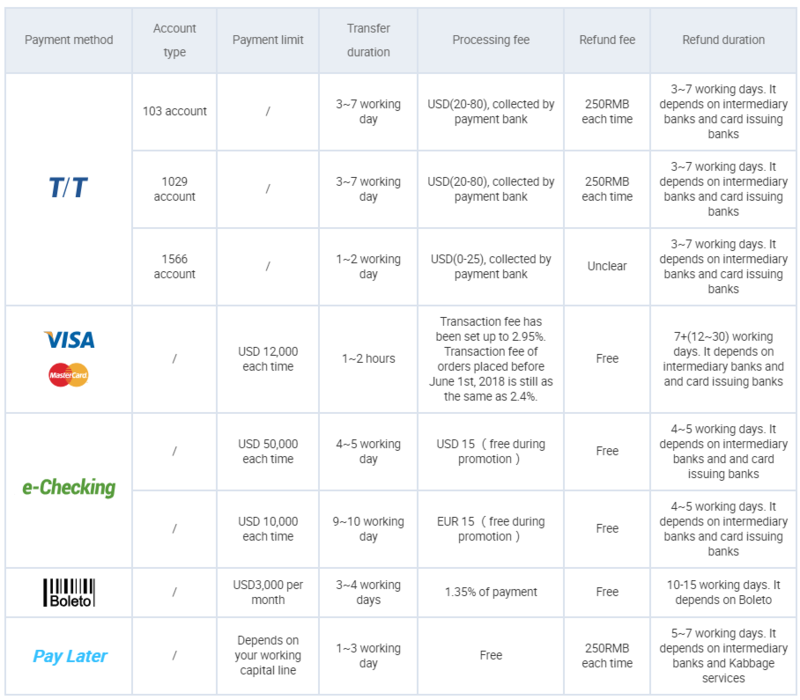 T/T: receive the refund within 7 working days. e-Checking: receive the refund within 3 working days. Pay Later:receive the refund within 15 working days. Please note that remote locations may take longer to process the refund. How to use Trade Assurance?